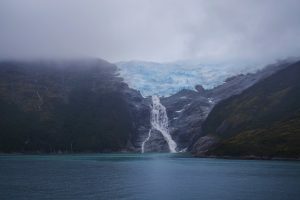 Finally, we have arrived at one of the highlights of our voyage, the Patagonia Fjords! The expansive Patagonia region is approximately 1.1 million square kilometers and is located at the southernmost tip of South America. The distance to the South Pole feels so close you can almost see it. The landscape is filled with mountains that rise like needles, falling glaciers whose roars break the silence, and rivers fed by melted glacier flows. There are still many landscapes of the earth that we haven’t seen, some of them as wild as ever, they all possess a limitless beauty. 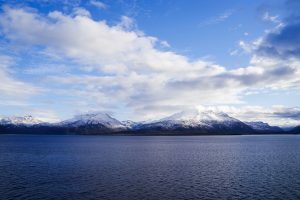 We set out on tour of the Patagonia Fjords with high expectations! 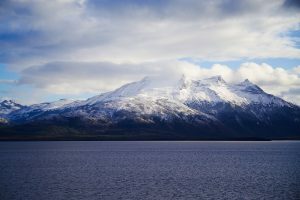 The place name “Patagonia” is derived from the indigenous people who were first discovered by the explorer Magellan when he traveled to Patagonia in 1520. Seeing the large-footed indigenous people in fur, Magellan called them patagon, “pata” meaning foot and “gon” meaning big. This is said to be the origin of the name Patagonia. 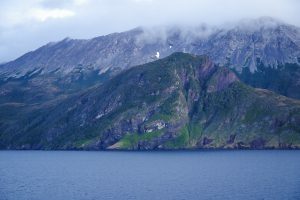 The Ocean Dream travels through the narrow fjord carefully like threading a needle. 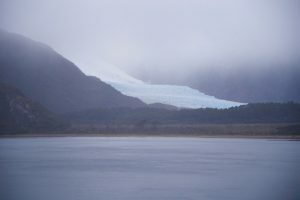 As we travel the fjord, a glacier that emits a fantastic blue light appears in the deep mist. 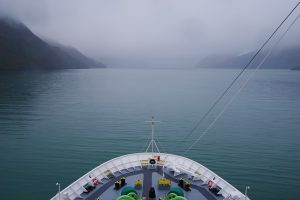 Passengers can be heard saying, “They look like gems!” and “How long do they continue on for?” The deck is packed with excitement, making everyone forget about the extreme cold of the snow as they gaze at the glaciers. The glaciers of Patagonia Fjord each have their own names, but among them, Romanche Glacier surprised us with its overwhelming force. The sight of the waterfall flowing from the glacier that glows like a turquoise stone is spellbinding. The dramatic changes of the earth from tens of thousands of years and hundreds of millions of years ago are still playing out right in front of us. The next thing that appeared in front of the Ocean Dream is a huge glacier named Pio XI Glacier. The deck is filled with cheers at the skilled maneuvering that brings the ship up to the very edge where we feel the great power of the Pio XI Glacier. Then, an even more surprising thing happened. 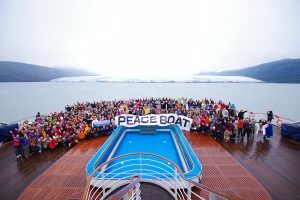 They rotated the hull of the ship and we took a group photo against a huge glacier background, it was a wonderful memory that we will never forget! 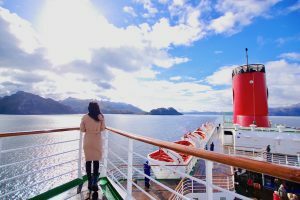 The magnificent views of the Patagonia Fjords will stay in our hearts forever.